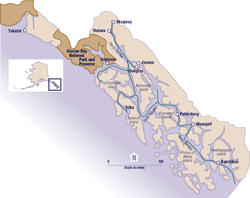 Southeast Alaska is the northern terminus of the Inside Passage, a protected waterway of convoluted passages between islands and fjords, beginning in Puget Sound in Washington state. This was an important travel corridor for Tlingit and Haida Native peoples, as well as gold-rush era steamships. In modern times it is an important route for Alaska Marine Highway ferries as well as cruise ships. Southeast Alaska has a land area of 35,138 square miles (91,010 km2)[ citation needed] comprising seven entire boroughs and two census areas, in addition to the portion of the Yakutat Borough lying east of 141° West longitude. Although it has only 6.14 percent of Alaska's land area, it is larger than the state of Maine, and almost as large as the state of Indiana. The Southeast Alaskan coast is roughly as long as the west coast of Canada. The 2010 census population of Southeast was 71,616 inhabitants, about 45 percent of whom were concentrated in the city of Juneau.